The ideas of Class, culture or custom differences were always a vague issue in our family ethics. My parents say intelligent ordinary working people do not require those things to attain respect or greatness. Always remember we earn money with effort, but respect requires hardship and intelligence requires constant alertness. So, the food habits of our family encompass many things which are known as antireligious ethics or poor men's domain. This recipe, my grandmother had learned from their farm servants, locally called Munish, and always catered it happily to the family demands. Like this recipe there are numerous other astonishing recipes. I was wondering if I could retrieve all the same. It is not popular because the food part contains calcium oxalate crystals and that must be removed during cooking. The plant is inedible when raw and considered toxic due to the presence of calcium oxalate crystals, typically as raphides. There are many ways to cook taro to avoid the ill effects of the sharp calcium oxalate crystals and raphides in raw taro. A method to reduce the calcium oxalate content in the taro by cooking especially with a pinch of baking soda. It can also be reduced by steeping taro roots in cold water overnight, discarding the water and properly cooking the kochu's root, stem or leaf without any misgivings. The Bengali says Kochu "the egg from earth" for all kinds of Taro, Arvi, Arum or even for Eddoe and credit Kochu for saving them from the famine of 1943. Most varieties of taro have calcium oxalate crystals throughout the plant. All parts of the taro plant contain acrid principles that are irritating to the mouth and oesophagus. The acridity can be destroyed by cooking. The whole plant, root, stem and the leaves are good source of carbohydrates, potassium, carotene [content is twice that of potato] and vitamin B-complex [contains greater amounts than a whole glass of milk]. They are also a good source of iron, vitamin C, vitamin B, [riboflavin] and vitamin B1 [thiamine] and minerals. The method involves peeling, washing, steeping, boiling and drying, which is expected to remove about 93.14% of the original calcium oxalate content, but some people are allergic to it so do not eat too much at first try and do not feed it to babies or young children. It can cause upper airway obstruction, itching due to skin contact as well as disrupting the bio-availability of calcium. No specific antidote is there, but in Bengal we used to have lots of chili, tamarind and sour lemon to prepare or to cook kochu and always avoid drinking water soon after eating the dish. Select taro roots that are firm and heavy for their size and unblemished. Taro root should have no mold, soft patches, or wrinkling and should be firm to the touch at both ends. Freshly dug taro will be pinkish or whitish green at the stem end. Just cut taro should be juicy and smell fresh. Large taro roots can be fibrous, dry, and mealy when cooked but have a nutty sweetness. 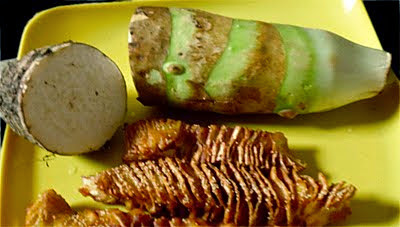 If you have planned to keep taro for one or two day keep in a cool, dark, well-ventilated place not in the refrigerator. It is best to use taro as soon as possible because it tends to soften quickly. Taro is a starchy root vegetable that has a sweet, nutty flavor—a flavor and texture that seems a combination of chestnuts and potatoes. The part I used for this recipe of the taro we eat is called a corm. The underground part of the plant is composed, outwardly of concentric rings of leaf scars and scales. The corm is composed of a thick, brown outer covering and fleshy parenchyma within. It is really an underground stem swollen with stored starch. The amount of water in the corms may vary in different kind of corms. The color of the corms may be white, grey, yellowish, purple, or pink. The Shola kochu variety I have used has very less particles of calcium oxalate crystals and less water so it is safe to cook without boiling less cooking Bengali recipe varieties of shola kochu. Wash and clean the fresh taro and pat dry with kitchen towel. Make dry spice powder, keep aside. Make a batter with rice flour, all purpose flour, baking soda, red chili powder, poppy seeds with enough water to make a semi-thick batter. Cut out and discard the outer rind of the corm. Cut it into thick slices round disc. Follow the same so that you can get 4 discs. Take one disc and cut it in the middle of the disc to make two half-moon shape slice. Repeat the following for all discs. Now take one half-moon slice, put it flat on the vegetable board. Take a sharp knife, make a straight slit on the dice with closer cuts at half breadth of the disc. Reverse the disc. Now on the opposite side make a slightly slanted slit at just about 10 degree and of course until half breadth of the disc to craft the vegetable. Repeat for all of the following half discs. Soak all pieces in the salted water for at least 2 hours. After discarding steeped water, wash thoroughly in tapped water repeatedly. Now you can stretch the designed pieces easily. Heat the oil in a flat pan. Take the batter, add and mix the spice powder. Now Take the crafted taro, fold in batter, put the slices in the pan by pulling both the end carefully, and deep fry all sides in the hot oil until golden brown and crispy. In no time the hot and spicy taro chips will be ready. Serve your hot and beautiful creation sprinkled with chat masala. The Sanskrit name of Taro is Colocasia antiquorum or Colocasia esculenta , Sanskrit is Alupam or Alukam, trade name Taro, cocoyam. Local names are Bengali - Kachu, Hindi - Arvi, Kachalu, Ghuiya, Kannada - Kachchi, Samagadde, Malaylam - Shembu, Oriya - Saru, Marathi - Alu, Tamil - Seppan-kizangu, Telegu - Chemadumpa, Gedda. Propagation for this recipe is corms. The Corms are rubifacient and laxative and also used in treating otalgia and internal haemorrhages. 1. Ordinary taro [Colocasia esculenta] synonyms: Arum esculentum, Caladium esculentum, Colocasia antiquorum. Eddoe or Eddo is a tropical vegetable, a variety of Colocasia esculenta that is primarily used for its thickened stems. The common name is Arum [India]. The plant is a staple food in many tropical countries and very popular in the Pacific islands. 2. Swamp taro [Cyrtosperma chamissonis] is called by different names in different islands. It is a native of Indonesia and Malaysia. In Kiribati it is called babai, in Fiji it is called via kana and in Tuvalu it is called pulaka. This is the main kind of taro grown by the atoll people in Kiribati, Tuvalu, the Marshall Islands and the Caroline Islands. 3. Chinese taro, Kong Kong taro, Tannia, Yautia, Cocoyam [Xanthosoma sagittifolium]. It is common in the Cook islands and Tonga and less common in other islands. In Fiji it is called dalo ni tana and in the Cook Islands it is called taro tarua. 4. Giant taro, wild taro, kape, elephant's ear [Alocasia macrorrhiza] is not usually planted but grows wild in the volcanic islands. It was cultivated in eastern Asia. In Fiji it is called via kau.